In a shiny black dress, with a top that could have adorned a Papagena in mourning, the most famous active soprano in North America walked onto the stage of the sold-out Kennedy Center's Concert Hall on February 15. Renée Fleming, with Hartmut Höll at the piano, went right into The Blessed Virgin's Expostulation by Purcell. A most dramatic and forceful virgin it was, and over the oddly subdued, stiff piano accompaniment she engaged in modulation exercises and vibrato orgies that also mark her Handel album (see Ionarts review). All that, of course, with her exquisite voice, undoubtedly heard even in the last row of the second tier. Renée Fleming is one of the few artists with the clout and fame (and ability) who can choose any program they like. Even an all-Schoenberg, Webern, and Berg program would sell out and draw wild applause, I suspect. (Berg, actually, was on the program, in what turned out to be the most satisfying part of the night for me.) Perhaps this ability to expose repertoire to an audience otherwise not likely to lend their ears to particular works played a role in her choice of Purcell for one-quarter of the recital? Charles, who was also there, would likely balk at the suggestion that a quarter program of Purcell was somewhat risqué, but then his ability to appreciate and love Purcell far exceeds mine. Still I could not help to see Expostulation especially, but also Sweeter than Roses, I Take No Pleasure in the Sun's Bright Beams, and I Attempt From Love's Sickness to Fly (chuckle-inducingly delivered) as stiff and a bit stilted. Good vehicles for her voice they may be ("historically incorrect" as can be, for good measure), but I admired and appreciated it more than I loved it. Handel was next and likely catered most to the expectations of the audience, probably half of whom was just off her recent album, which is—even if I have some reservations about it (see Ionarts review)—perfectly beautiful. Quite expectedly, she 'let fly'. And amid Höll's more animated playing (even La Fleming bobbed along with the interludes, much to the amusement of the audience) and Handel's music, she delivered radiantly. When I criticized her Handel album because you could tell that more than Handel, she loves herself, in Oh Had I Jubal's Lyre she showed as clearly as possible that it was Handel she loved. Even O Sleep, Why Dost Thou Leave Me?, which opens the record, was better live and much less self-conscious. To Fleeting Pleasures Make Your Court (from Samson) and Calm Though My Soul (from Alexander Balus) were equally fine. Allowed to applaud, finally, after Endless Pleasure (from Semele), the audience gave decibel-strong proof that they did indeed think the first half of the concert to have been such. The Diva emerged after intermission in a dream of white crepe and glitter to oohs and aahs and encouraged the audience to read the text to the Berg songs. (Perhaps she should have dressed less spectacularly to make that task easier?) I trusted my German and kept looking at her, anyway, and listening especially, because these teenage Berg songs are among the best works that any composer (including Mendelssohn, Korngold, and Bridge) wrote at such an early age. 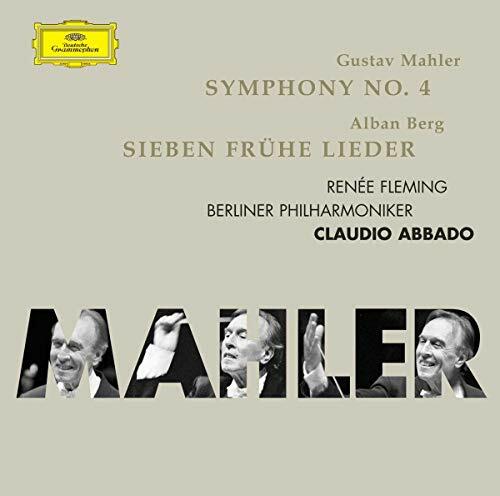 Nacht, Schilflied, Die Nachtigall, Traumgekrönt, Im Zimmer, Liebesode, and Sommertage should appeal to anyone with a set of functioning ears, but at least to those who delight in Richard Strauss, Mahler, Wagner, or Duparc. Hartmut "Hesitates" Höll’s piano playing was a bit more assertive than during the Baroque works but could still have been a good bit bigger and independent for my taste. A performance so taken back almost (and ironically) called more attention to itself than should have. Fitting the angelic image on stage, Renée Fleming sounded ethereal in the Berg, beautiful but not quite as effective as Alessandra Marc's earthy, all-out approach I enjoyed at the National Gallery last October (see review). Schumann at last—eight songs—and lounging in the nook of the grand Fleming set the vocal standard in creaminess and sweetness for, at least, this season. (I must say it though: underplaying Schumann's "accompaniments" makes no sense to me, not in any case and especially not when even La Fleming's pianissimo is unlikely to be drowned out.) With a very round voice, rather than a steely, singular edge that more piercing sopranos have, she creates a haziness that is very comforting and no small part of her wide appeal far beyond the realm of opera and recital aficionados. It may even be key to a good (successful it will be, anyway) jazz recording, which is soon to be released. Du bist wie eine Blume, meanwhile, is not only one of Schumann's better songs, it must also have felt lucky to be sung by Renée Fleming. Her stage demeanor, too, is perfectly calibrated for effect, having the audience eat out of the palm of her hand, courtesy of just a look, a frown, gesture, a smile. Encores were generous and started with Puccini's O mio babbino caro. It isn't exactly the type of thing that sends me into the same applause convulsions as the rest of the audience (none of whom left early or after the regular program was finished, setting what must be a Kennedy Center record), but then I have a troubled relationship with Mimi & Co., anyway. Still, her pianissimi were unquestionably spectacular. Had it not been for encores nos. 2 and 3, I would have been disappointed by the evening, but there they were: Richard Strauss's Cecilia and the last aria from Korngold's Die Tote Stadt. Fleming rightly pointed out that no concert of hers would be complete without Strauss. That's the music for which I think her voice was made: all nagging was forgotten and even the piano seemed to do its part. Stunning. Korngold, if anything, was even better, sung enthrallingly after Fleming's somewhat more endearing than poetic translation of the lyrics. This is Korngold at his best and with Fleming's mascara-dark eyes emphasizing the sadness it was made even more memorable. I was happy, Charles delirious and enchanted (Purcell lovers, I say...). We still don't know what happened the following day!! !